Events in Microsoft Dynamics NAV (and in Dynamics 365 Business Central) are one of the best features of the platform ever. 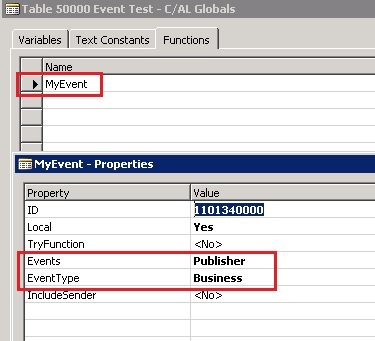 With events, you can now extend your business logic without modifying the original objects and events are the core for the new Extension model that we’ll use for Dynamics 365 Business Central. However, there’s a little strange behaviour regarding events that personally I don’t like and that sometimes can be the cause of many problems in a business process. I want to show here what I mean with a quick example. Save and compile the table, then try to compile the previously defined codeunit 50001. Magically, it compiles, no errors are triggered. This behaviour is quite strange, because 99% of the times no errors are triggeres, while I’ve found that sometimes an error at runtime is triggered that alerts you about the event change. Obviously, this is a stupid example, but imagine a business process where this event passes values to a function used for modify data in NAV (if the event is triggered, data are modified otherwise no). If the event is changed and then it’s not triggered because in C/AL noone has modifyed the subscriber, my business process could give a wrong result. Someone could say that there’s a “non written rule” that says that Business Events should never change signature across product releases, but this occours for Business and for Integration events. Ok, NAV provides the Event Subscription view (from Development Environment, on the Tools menu, choose Debugger, and then choose Event Subscriptions) where you can find all Subscribers attached to a published event and if parameters mismatch occours (remember to ALWAYS check this view! ), but this is not enough because in a distributed development environment many times you forgot to check here. Why, during compilation of objects, a compile error cannot be triggered? If in my example Codeunit 50001 will not compile, I’ll discover immediately the event signature change and I could act accordingly by modifying my event subscriber. UPDATE: official response from Microsoft: This is actually checked by the new compiler. We have no plans of fixing it in C/SIDE. It’s by design — they’re unlikely to change logic on the classic development environment. Incidentally AL does enforce this. It should only be a warning however, as there are scenarios where you want lose coupling.